In anticipation of the expected August release of the final Clean Power Plan, which will establish the first-ever federal limits on carbon pollution from power plants, the Council has been evaluating various options for Iowa to reduce carbon pollution to comply with the final standard. Iowa’s leadership in wind energy has already cut carbon pollution and positioned the state to comply with its proposed 16% reduction goal. 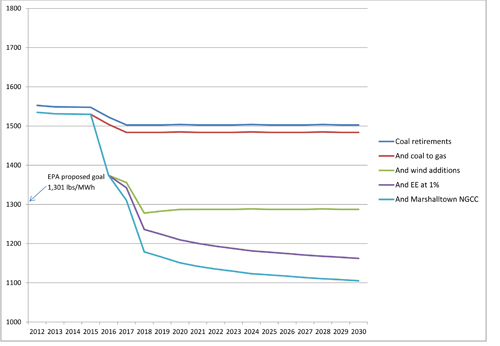 However, other actions resulting in carbon pollution reductions (including the retirement of older coal plants, the conversion of coal plants to natural gas, and the maintenance of modest energy efficiency programs) need to be evaluated, as well as Iowa’s potential to comply with a stronger reduction goal. Iowa’s baseline emissions rate in 2012 was 1,552 lbs/MWh. The EPA’s proposed 16% reduction is 1,301 lbs/MWh. The five actions analyzed above bring Iowa’s emissions to 1,105 lbs/MWh, well below the proposed EPA goal. This means that Iowa will likely be in compliance with the 2030 goal as early as 2020. If the final goal is stronger, modest additional actions will allow Iowa to comply. To evaluate Iowa’s compliance potential using energy efficiency and wind energy alone, the Council used a publicly available modeling tool from MJ Bradley & Associates. If Iowa’s reduction goal is approximately 29% rather than 16%, Iowa would need to reduce its emissions rate to 1,103 lbs/MWh by 2030. Iowa could reach this goal by adding 22 MW of wind per year and maintaining a 1% annual energy efficiency savings from 2020-2029. If Iowa’s goal is even stronger– a 42% reduction – Iowa would need to reduce its emissions rate to 906 lbs/MWh by 2030. Iowa could comply by adding 170 MW of wind per year and maintaining a 1% annual energy efficiency saving from 2020-2029. 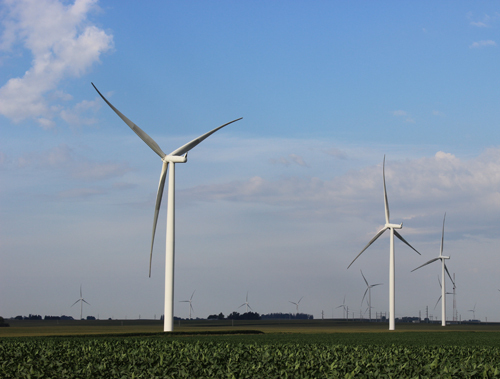 These actions are readily achievable: From 2008 through 2015, Iowa averaged over 635 MW in wind capacity additions annually and has seen over 1,000 MW of wind constructed in a single year. Per these evaluations, as well as those of several other clean energy experts, Iowa is well-equipped to meet its proposed 16% carbon reduction goal or a significantly stronger goal. 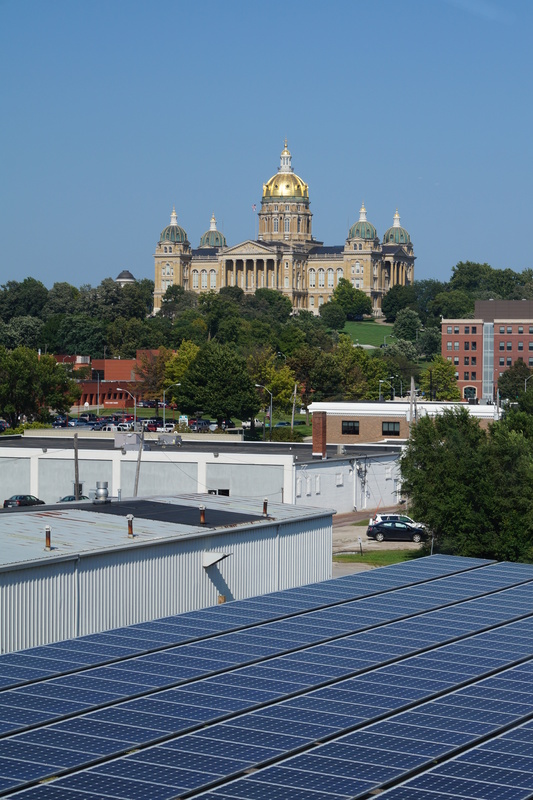 Regardless of the final goal, we look forward to working with the state’s leaders to shape a strong implementation plan that maximizes Iowa’s potential for renewable energy growth and energy efficiency savings. Several recently-released, independently-conducted reports concur that reducing carbon pollution would improve public health. Today, the National Resources Defense Council (NRDC) released its annual “Sneezing and Wheezing” report detailing the negative respiratory health impacts of increased ozone and pollen concentrations that are expected to worsen if carbon pollution levels continue to rise. According to the report, carbon pollution has been linked to increased ragweed pollen levels and contributes to conditions which increase ground-level ozone. Both ozone and ragweed pollen exacerbate allergies and asthma, serious and costly health issues that affect approximately 50 million and 26 million Americans. Ragweed pollen allergies alone are estimated to contribute to more than 3.8 million missed work and school days per year. To protect public health, the report recommends adopting the U.S. Environmental Protection Agency’s (EPA) proposed Clean Power Plan. Expected to be finalized this summer, the Clean Power Plan would establish the first-ever limits on carbon pollution from U.S. power plants (the nation’s largest source of carbon pollution). Recommendations to adopt a strong Clean Power Plan were also echoed by the American Lung Association (ALA) last month in its annual “State of the Air” report. The ALA report details progress in improving our nation’s air quality by examining ozone and particle pollution levels across the U.S. Reducing carbon pollution under the Clean Power Plan would also simultaneously reduce levels of these other harmful pollutants. The result would be a significant public health benefit, according to researchers at Harvard, Boston and Syracuse Universities. In a peer-reviewed paper released last week, the researchers found that additional reductions in sulfur dioxide, nitrogen oxide, and particulate matter resulting from carbon standards like the Clean Power Plan would help prevent 3,500 premature deaths; 1,000 hospitalizations; and 220 heart attacks per year in the U.S. and avoid 47 premature deaths in Iowa alone. EPA has estimated that American families will see up to $7 in health benefits for every dollar invested in the Clean Power Plan and, in total, the agency estimates the plan will result in $55 to $93 billion in health and climate benefits.